Detective Niels Troelsen and his partner Detective Elan Cohen are once again primed for canine intrigue in Cerberus Confidential, author Stacy Benedict’s offbeat and incredibly creative new science fiction/mystery mashup. In this slim volume, the two detectives must figure out just what happened to a libidinous lady who has stepped away from her husband and boring job to seek adventure with her problematic paramour, who is himself torn between what he ought to do and what he knows in his yellow-bellied heart he will do. And so a first-rate conundrum begins to consume the two Canine caste Primordials — who in actuality hail from a faraway world called Arimoi. They’re on Earth to protect humans — from other humans. They visit the victim’s place of employment, trendy VigorNourish, to try and unearth some kind of clue that will shed much-needed light on the case. Surveillance cameras in the company’s parking garage give a hint as to the noontime activities of the missing woman and point the pair of detectives in a promising new direction. A visit to a nearby shooting club puts them in touch with a nervous archery instructor — Ernest Truman — who flees after the brief interview to an emotional meeting for shopaholics and hoarders. Niels — who takes the form of a dachshund and hides under a table to eavesdrop during the meeting hears the unfortunate archery teacher break down, confessing the purchase of thousands of dollars worth of leather goods — the very items that came tumbling out of a locker rented at the club by the missing woman earlier. On and on the plot deepens, as every page turn reveals a new suspicious character for the reader’s consideration as a potential perpetrator. So much great writing, so little room in this review to recount all of it. 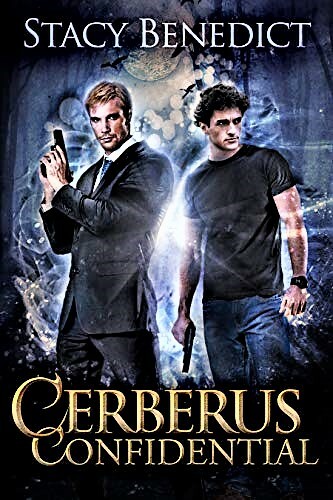 Five-plus stars to Cerberus Confidential. Come for the curious concept of shapeshifting detectives. But stay for a roundhouse solution to the mystery that would have impressed Charlie Chan.